different than in the rest of Easy Croatian. I'll give a brief overview of dialects in Croatia and neighboring countries. 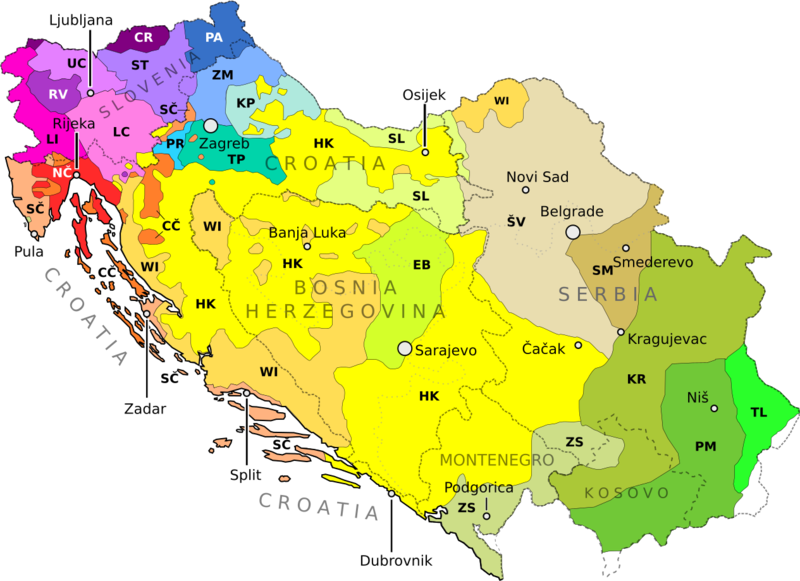 Croatia belongs to the South Slavic language area, and to the wider Slavic area. Both these areas are essentially dialect continua, that is, areas where any dialect is similar to the dialect next to it, which is similar to the one next to it, and so on: difference between dialects increases with distance, and there are very few sharp dialect borders. • There are fewer noun forms (that is, different case endings). In Slovenia, nouns have singular, dual and plural forms, and 6 cases with different endings in plural. In the area around Niš, Serbia, there is only singular and plural, and only two cases (N and A). In Macedonia, nouns have no cases! This doesn't apply to the vocative case, though. • There are more verb tenses in use. In the western parts of Croatia, the aorist tense is very rarely used. It doesn't exist at all in Slovenia. In Serbia, it's used every day in speech. When you reach Macedonia, there are 9 tenses. • Infinitives are less used and finally disappear in South of Serbia, where only da + present is used. • Vocatives are more often used – in western parts of Croatia, vocatives are rare, N is used when calling someone. In Bosnia and Serbia, they are frequently used. • There are more Greek and Turkish loan words further you go to the south-east. Each feature splits the area at a different line. Standard Croatian has the ‘eastern’ možeš, but the ‘western’ četvero. ‘Torlak’: PM - Prizren-South Morava, TL - Timok-Lužnica. There are other ways to divide dialects: for example, the classification of ‘Čakavian’ dialects shown here is after Dutch linguist Willem Vermeer; you'll find other ways to classify them in many books. Some dialects shown here together are usually shown separately – even if they are quite alike neighboring ones – for traditional (and political) reasons (e.g. Lower Carniolan dialects in Croatia are usually shown separately as ‘goranski’, etc. The grouping of dialects into ‘Kajkavian’, ‘Čakavian’ and ‘Štokavian’ is usually presented as something fundamental. However, it's not really so: for example, Northwestern Čakavian dialects have a lot of similarities with the Littoral dialects in Slovenia; ‘Kajkavian’ Zagorje-Međimurje dialects have many similarities with Pannonian dialects in Slovenia; ‘Torlak’ dialects are often grouped with ‘Štokavian’, but they have many similarities with dialects in Macedonia and Bulgaria as well; there's no sharp border between Southeastern Čakavian and ‘Štokavian’ Western Ikavian; ‘Štokavian’ Slavonian dialects have similarities with ‘Čakavian’ dialects, etc. To mark long vowels, in descriptions of old, reconstructed forms, and in brief descriptions of various dialects, I’ll just write them double, e.g. aa or ee. For instance sun was sllnce and hand was rööka. Developments of the old vowels ě and ə – often called yat and yer – are most obvious to the majority of speakers. Actually, ‘Ijekavian’, ‘Ikavian’ and ‘Ekavian’ are just different developments of the vowel ě (yat). The vowels ë and ö were nasal, like in today French or Portuguese. There were also two specific consonants, usually labelled as d' and t'. They were palatal (softened) d and t. The verb doći (dođe) was earlier dojti (dojde); in some dialects, jt and jd have later changed. (I'm using slightly specific symbols here; usually, in specialized literature, ę and ǫ are used instead of my ë and ö. Unfortunately, they are not displayed properly on some mobile phones and e-book readers. Also, ḷ and ṛ are usually used instead of l and r. Neither symbols are compatible with the IPA notation). The tone I mark as aa is also called ‘neoacute’; it doesn’t exist in Standard Croatian. This can be summarized simply: the first underscored vowel is stressed, the underscores mark high tones. Therefore, what I write as e.g. öö is in most linguistic works written as ǫ with-a-tilde-above. An example ‘Kajkavian’ dialect is the speech of Konjščina, with a detailed description by Vedrana Gudek, available online. The vowel ε – a kind of ‘open e’, like in English bad or German ä – is the characteristic vowel for ‘Kajkavian’. Unfortunately, it’s usually written just as e: there's no proper orthography for it (dialectologists usually use ȩ, which is not visible on all devices, or sometimes æ). Vowels ie, uo, ou are diphtongs, similar to English ow in low, how, but the i's and u's in them are, unlike in English, pronounced very quickly, they are very short, so I could have written them also as ie, uo, ou. The sound clips are by a native ‘Kajkavian’ speaker, from a village 14 km from Konjščina, speaking a very similar dialect. (For comparison, forms spoken in Zagreb are given in brackets). Many ‘Kajkavian’ dialects (but not all) have -e instead of -o in all neuter nouns and adjectives in neuter gender, i.e. sεεle village vs. std. selo. The old jd and jt are mostly unchanged in ‘Kajkavian’, while t' changed into č, and in most dialects d' into j. There's no ć sound – only č, which is pronounced a bit ‘softer’ than in the Standard Croatian. Consonants at the end of words become ‘devoiced’, i.e. d is pronounced as t, b as p, g as k, z as s, etc. For instance, the z in mraz frost is actually pronounced as s, while the pronunciation of genitive mraza is as z, since the consonant is not final. A-M • O-P • R-Ž – under construction! The AZW3 file works nicely on Kindles 4th and 7th generation, it's not tested on other models. Feel free to use this work in any way, but please acknowledge the source if you republish it elsewhere. I'm not a professional language teacher, and I would be grateful if anyone points out any errors or ways to improve this small 'course'. Easy Croatian © Daniel N. 2014-2018. Template by Urang-kurai (modified). Powered by Blogger.